Beach Lane Books (Simon and Schuster), 2017. 36 pages. This book is SO FAB! Why, oh why, has no one ever before written a book about how beautiful life is if you are goldfish in a child’s aquarium? This is a needed niche – any child with a fish will love it – and on top of that, the story is tremendous fun to read aloud, with bright, colorful pictures. It’s got enthusiastic language and plenty of onomatopoeia. 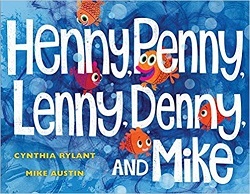 Henny, Penny, Lenny, Denny, and Mike are five fish who met at the fish store. The fish tank is like HEAVEN. Henny loves the orange gravel. Denny loves the pirate ship. And Mike loves the bubbles. Nobody loves the snail, but that’s okay. There are a surprising number of adventures that happen in the lives of Henny, Penny, Lenny, Denny, and Mike. They hate Clean the Fish Tank Day – but are so excited and happy when the girl makes everything just sparkle. And then new fish enter the tank! And a new fairy castle! There’s one little problem at the end, and we’re all surprised by who saves the day. I just can’t express enough how much fun this book is to read. I bet you can’t read it and not smile. After all, fish tank life and this book are both SO FAB! This entry was posted on Friday, October 13th, 2017 at 11:09 pm and is filed under Animal Characters, Delightfully Silly, Picture Book Review, Starred Review. You can follow any responses to this entry through the RSS 2.0 feed. You can leave a response, or trackback from your own site.